Forming a metal is definitely a complex task. But if you are a fabricator mechanic, you must need to form a metal tube or pipe every now and then. In this case, you should use a tube bender to get the perfect angle every time you need. It will also lessen the risk of damaging the pipe or tube. So finding the best tube bender should be your main concern for this job. There are various types of tube benders available in the market. Each of them has a particular use. Today we will highlight upon 8 best tube bender for roll cage and some important issues that you need to consider before buying one. Hope this will help you to decide which one will be perfect for your job. This is a 16 ton hydraulic pipe and tube bender with a set of 8 dies. The manufacturer is Generic, and they first launched this item in 2016. This machine is claimed as suitable to work with in both horizontal and vertical positions. All the dies are made of cast iron and the sizes are 1/2; 3/4; 1; 1-1/4; 1-1/2; 2; 2-1/2; 3 diameter. The marketer made this tool suitable to deal with gas and air pipe. Our realization about this product is, in the product description varies from the product title in amazon. From the title anyone will assume that, this product is meant for tube bending of roll cages only. But in the product description, the manufacturer claims its suitability for pipes only. On the other hand, the die sizes included with the packaging are best suited for pipes mostly; not for roll cage tubes. Roll cage tubes are different is size, shape, material and thickness from other tubes or pipes used in industrial environment. However, we tested this device to mend a mild steel tube of 1/2 inch diameter with 0.9 wall thickness. The tube kinked at the bending spot after a 40 degree bending. Some suggested to fill the tube with sand to prevent kinking or flattening but we did not try it further. Comes with 8 dies of 1/2; 3/4; 1; 1-1/4; 1-1/2; 2; 2-1/2; 3 sizes. Less suitable for making roll cages. Why one should invest in a manual tube bender? These benders are portable, affordable and lightweight, that is why. A manual tube roll bender is much easier to handle than hydraulic ones. 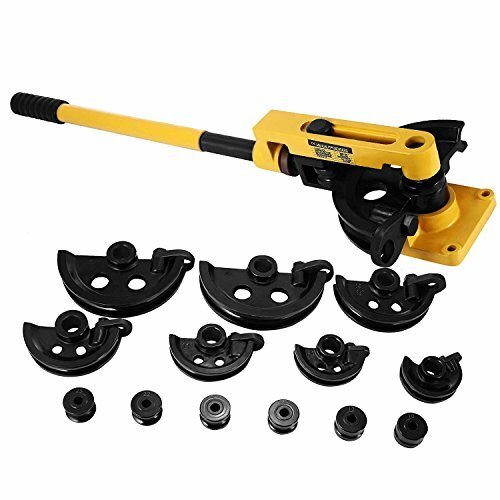 Meet manual pipe tube bender from Happybuy. This little tube roll bender can do all kind of bending with some added benefit. One is, it comes with 7 dies ranging from 3/8 to 1 inch size. With this lightweight bender, you can bend pipes and tubes from .8 mm to 2.0 mm thickness. Building your roll cage will be extremely exhaust free using Happybuy pipe tube bender. When we tested this bender, Its long handle worked swiftly and efficiently. Neither had it require much space nor high maintenance in our garage. But the product is not polished like the expensive ones. The best feature of this device is anyone can be creative and make unique roll cages or other things; because, Happybuy pipe tube bender will bend pipes and tubes to any angles. This bender is not just to build roll cages; it is a versatile bender in the cheapest range. 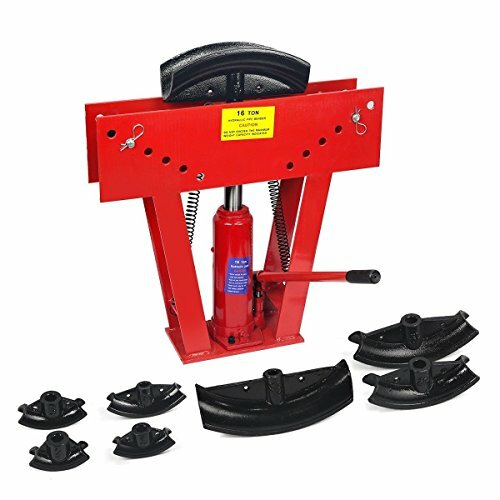 This heavy duty bender can mend pipes and tubes of 0.8-2.0mm wall thickness. This bender may not be as durable as the pricey ones. The manufacturer Pittsburgh claims their bender to be strong enough to deal with tough tubes like exhaust bars and roll bars of size ranging from 3/4 inch to 2 in diameter. With its ‘incremental bending’ one can achieve accuracy over the angles and desired curves of the tubes. Dies are available for square tubes also on purchase. Our findings over this machinery are different from the expectations. It has all the features the manufacturer claims but the twist comes when we actually used it in our workshop. Its ‘incremental bending’ is a feature that is a result on less force over the metal. As a result, it took a long time and several trials to bend one pipe of 1.5" sch40 aluminum to our desired angle. But it truly ensured accuracy at the end! Another realisation is, the limited manual pressure it creates over the metal tube is not suitable to bend harder metals. The structure is strong but not high-end quality. We found the screws of the driver axle are too small and some are deformed. It is undoubtedly affordable so the quality and performance we got from is not complainable. However, it does its job what it claims and can be useful for any garage or workshop. Incremental bending may require more time. Manufacturer 9Trading launched this item last month, july 2018. Hence this product is one of the latest hydraulic tube benders in the market. Like any other typical hydraulic pipe benders, this one is also capable of working in horizontal and vertical positions. Set of 8 dies are contained in the packaging of 1/2, 3/4, 1, 1-1/4, 1-1/2, 2, 2-1/2, 3 inch size. This machine is most suitable for bending pipes used in gas and air circulation. We tested this tool with a ¾ mild steel tubing of 0.9 wall thickness. We decided to give it a 60 degree bend. This tool creates nice bending no doubt. But ensuring the accuracy is a challenge. We took reading of the angle two times and were careful not to over bend it. But we made a 63 degree instead of 90. If you want to bend tubes with this tool, you must be very patient and take your time to do that. 8 dies of 1/2, 3/4, 1, 1-1/4, 1-1/2, 2, 2-1/2 and 3 inch size. May not be suitable for tubes we use in roll cages. 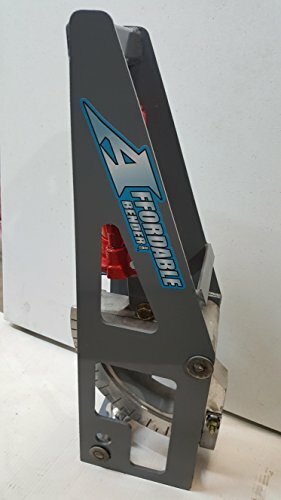 This hydraulic bender is not only manufactured by ‘Affordable Benders’ it really is an affordable hydraulic bender among all the hydraulic benders we tested. This bender is operated by an 8 ton bottle jack. A die set included in the packaging of 1-3/4" size and all are 7’’ radius. This bender works best for tubing of .080 to .120 wall HREW and ERW. But you can work with mild steel tubes of up to .134 wall; in case of Dom or 4130 chromoly tubes, this device can bend tubes as thin as .080 to .095 wall without any kink or flattening. Previously this tool could make angles up to 90 degree, but the latest version can mend tubes up to 110 degree. For testing, we picked a .080 DOM tube to give it a 110 degree bend. This bender did the job perfectly without any flattening or kink on the tube. Though, lining up the centre mark of the tube and ensuring accuracy of the angle was confusing at first. So, we decided to add a pointer on the leg and a digital angle finder. This saved us from over bending the tube and made taking readings easier. The finished result is, a flawless bend of .080 DOM tube without any hint of kink or flat spot. Then we realised how all the roll cages made with this bender pass the NHRA, SCORE and SCCA technical inspections. You can make it even more versatile by buying other dies for tubes of different size and shape. They have 5 inch radius dies of 1’’ and 1-1/4’’ and 7’’ radius dies of 1-1/2’’, 1-5/8’’ and 1-3/2’’. Dies for square tubes are also available. Anyone can be a master of making not only roll cages, but also other DIY structures for green house, boat railing and many more with this. Get professional results in affordable price with ab105 1-3/4" Hydraulic Tube Bender from Affordable Benders. Works without mounting to any surface. Cannot make 180 degree bending without cross handling. RIDGID’s 608 heavy duty pipe bender is the solution for those who never compromise with reliability and performance. This manual pipe bender can shape metals as hard as titanium. Its 16 inch long cushioned handles ensured added comfort and force while we used it for testing. One distinct feature of this bender is the built-in vice clamp. We tried it and this clamp has proven to be really useful to keep the tool in place while in operation. Locking and unlocking is also very easy; a half turn of the handle is all it requires to do the job. Creating a U-bend will not require cross handling of the tube. Its two-stage design can handle the task in one go. 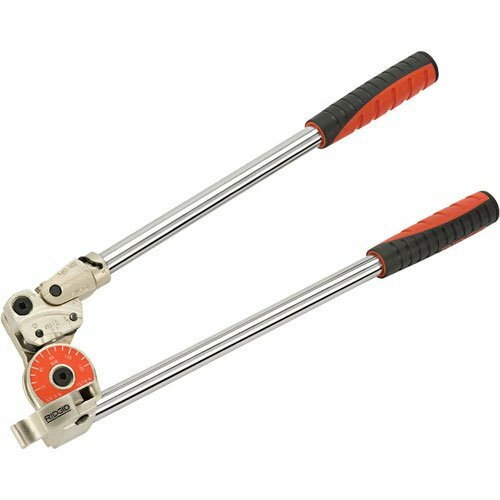 As the manufacturer claims, RIDGID 38048 Heavy-Duty Pipe Bender has a capacity of outer diameter of ½ inch and bend radius of 1-1/2 inch. The added benefit you get with fabulous features is a lifetime warranty of this machine. It perfectly worked to bend stainless steel tube of 1/2" Outer Diameter and .065 Wall thickness. We hardly felt any stress on my hand while working. The matter is, it needs a little space to work. For your peace of mind, pro quality performance and proven quality, you can rely on RIDGID 38048 Heavy-Duty Pipe Bender with your eyes closed. It is manufactured by century old manufacturer RIDGID. RIDGID is the name of quality and standard to all the users of their products. Bending forms are marked for desired alignment. Long handles require larger space for convenient operation. 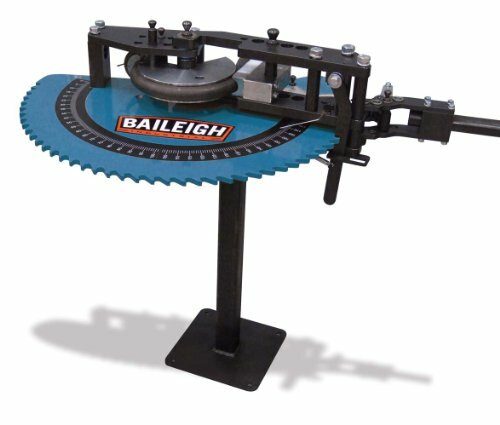 If you are looking for something unique for your garage without caring about the cost, then manually operated tube bender from Baileigh is meant for you. It comes in a revolutionary patented design with attached degree ring and three different speed settings. This bender has the capacity to bend mild steel tubes of 2-1/2 inches size outer diameter and 0.12 inches wall thickness. For chrome alloy tubes, its capacity can handle 2 inch outer diameter tubes with 0.12 wall thickness. The speed setting is another wonder of this machine. A 4 degree, 8 degree and 12 degree bend can be achieved with each push depending on the size and material of the tube. The first one is suitable for tough tubes, the second one for intermediate ones and the third one for lighter gauge tubes. For longevity and rust resistance, the thrust washer and pivot points are coated with aluminium-bronze. 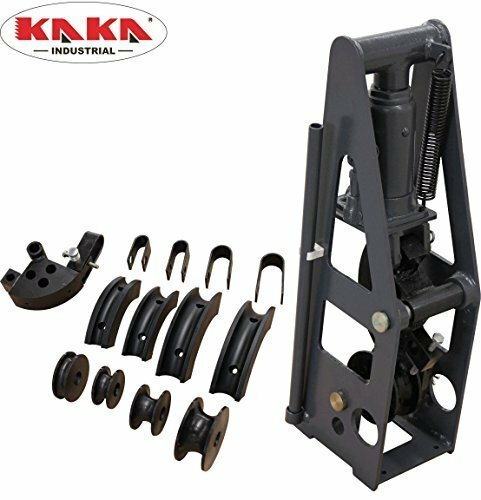 Unlike other manual benders this bender did not need any assembling before operation. All we did was insert the tube in the hook arm. We chose a 2 inch mild steel tube for testing the tool. The speed was set in to 1, and we tried to make a 75 degree bend. With Beileigh manual bender we successfully did the bending. The angle was precise because of the degree ring. Did not need to remove the tube or reset the machine. Consequently we tested speed 2 and 3 with chrome alloy and gauge material after resetting the speed settings. The result was satisfactory just as we expected. While resetting the bender for different size tubes, we found the hook arm really convenient. It has quick release inserts to insert and remove tubes. Resetting took merely a minute. This machine is compact with its stand, degree dial and handle. Only one drawback we found is, you have to purchase the dies separately. The most impressive feature of this device is, with this, you can do bending and taking the reading of the angles at the same time. This is a 8 ton hydraulic bender which provides 5 dies of 3/4", 1", 1-1/2", 1-5/8", 1-3/4" diameter, suitable for round tubes. The manufacturer KAKA industrials claim this machine to be stable, durable, easy to use and gives precise results. But the maximum angle can be created with this machine is 90 degree. After unboxing the product, we found the frame of this bender really has a sturdy construction and made with solid steel. But the product seemed lighter compared to other hydraulic bender of 8 ton capacity. The dies included in the packaging are quite enough for making roll cages of mild steel. 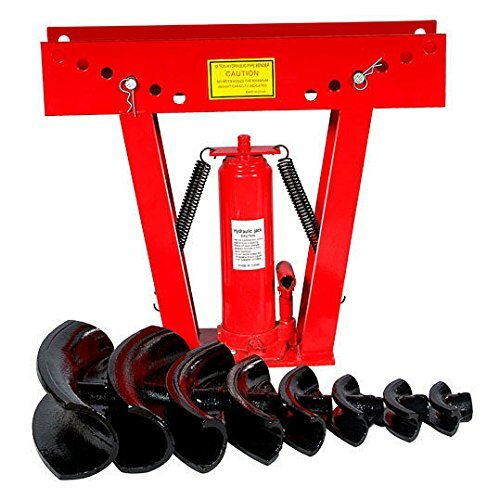 8 ton hydraulic jack is included to give the machine stability while working. For mild steel tubing of 3/4” and 1” diameter with wall thickness of 0.049” to 0.090” this bender is capable to bend up to 90 degrees. On the other hand, for 1-1/2”, 1-5/8” and 1-3/4” diameter of same material and wall thickness, it can only produce 60 degrees. 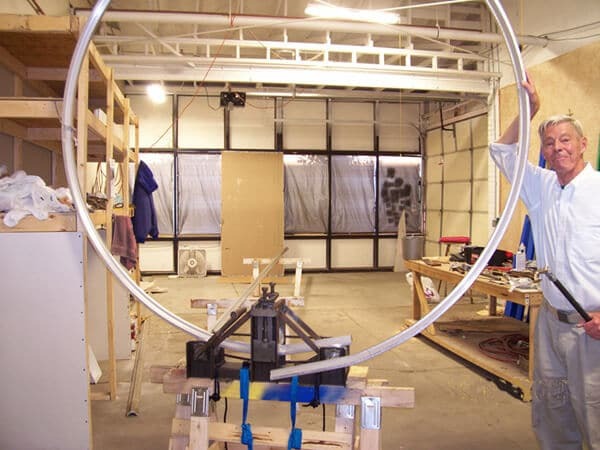 At first we took a 1-¾’’ chromoly tube of .04 wall thickness to make a 30 degree bend. The tube was supported by a die and cast followers. As a result the bending was nice, without flat spot or kink. The bending was precise as they claimed it to be but for the accuracy of the angle we had to take readings several times to prevent over bending. Then we tried to bend it further to reach 60 degree, but this time the die broke. We came to a conclusion that, this tool is okay to use on light tubes but not on tough ones. May be the durability and longevity they promised can be applied on the machine only, not on the dies. Despite of these facts, it is an affordable hydraulic bender to make other materials which require tube rending but not for durable roll cages. Dies from other manufacturers may draw different result. Five dies of a 34″, a 1″, a 1.5″, a 1 58″ and a 1 3/4″ diameter included. Makes angles only up to 90 degree. Before buying a bending machine, you have to consider various issues. In that case, the very first step is to determine your present bending needs and estimate the future growth of your business. Beside this, you will get an idea about other important consideration for the selection of a tube bending machine. We can discuss different types of bending machine and their uses. This method is used to bend a fixed radius forming die set which forms an empty tube. This is the most common method of bending used in structural, motorsport and industrial application. Mandrel Bending is mostly used for pipe & tube bending. In this bending technique, a solid steel rod is inserted into the pipe during the bending process to get wrinkleless, smooth bend. This method is used for turbos, headers, mass-produced furniture and cold air intakes. 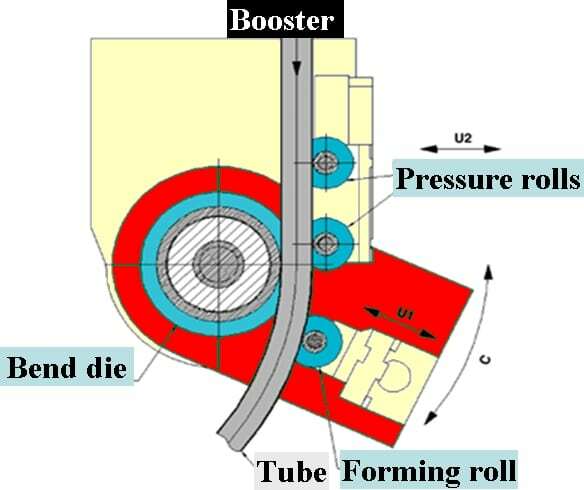 In Roll Bending technique, the pipe- extrusion has to pass through a series of rollers, it applies the pressure to the pipe and change the radius. In this method, a hydraulic ram is used to push a die into a tube. This bending technique is known as the simplest, fast and highly productive technique. It is used carports, exhaust system and gates. These benders are very economical and perfect for small productions and entry-level projects. Accuracy and repeatability may vary on the operator’s care for detail. An air/ hydraulic bender is powered by the combination of hydraulic and shop air. These benders offer hands-free bending with power but they are pretty slow for production. They are fitted with auto stops which offer accuracy to about 0.5 degrees. These benders are faster than air hydraulic benders as they are powered by electric hydraulic pumps. Like air hydraulic benders, they are also fitted with auto stops. These benders are programmable by the operator. And furnished with touchscreen, encoder and auto stops. You can get extremely accurate bend with this type of machine. For an efficient and quality bend, you have to make sure that your machine can handle the extensible strength of the materials for your assumed production number. Industrial grade and production style based benders can operate on full capacity on a daily basis. On the other hand- lighter duty or entry level can make you struggle after they had used at maximum capacity for the extended period of time. So get familiar with materials and verify that they match your bender’s capacity. The type of your operation will decide what type of bender & tooling is suitable for you. But when you are ready for bending job, considering the following information will help you to choose the proper machine for your job. The list of the best tubing bender and considerable discussed here will definitely help you to select the right one and save your time as well as money. After getting the right one you need to install, adjust the machine with the help of the instructional manual. And always remember to wear safety clothes and avoid overheating the bender. One more thing I would like to add that, always purchase your machinery from a reputed manufacturer with after selling support. This will add their expertise to your team which will make your machine function at the peak level.